Happy Friday! Happy UTMB Day! Yesterday my quad was really better than it had been in DAYS. I guess a little bit of rest does the body good. I ended up getting up early today and going for a run! I wanted to test out the quad and see how it felt all day after a run to determine if I should do my long run tomorrow or not. We’ll see how it goes, but so far I am optimistic! Getting up before the sun is SO uncharacteristic of me. Right now I feel WIDE AWAKE but I bet I’ll be gulping down ice coffees by 3pm. I don’t know how everyone else in the world runs so early every day, I could barely keep my eyes open during the first half mile! The Ultra-Trail Du Mont-Blanc begins today. It’s a 166KM mountain ultra with a total elevation gain of approx. 9,600m. 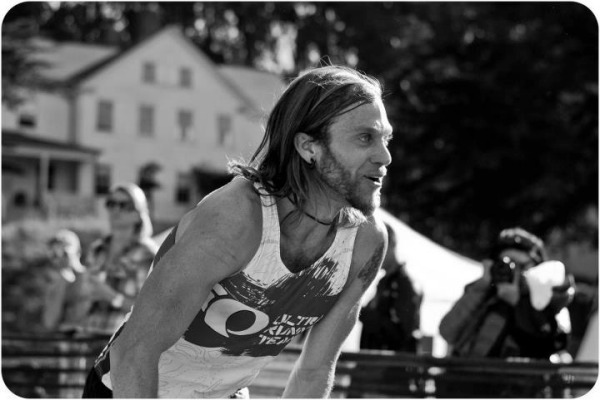 This is one of the most popular European ultras to follow and two of my favorite runners are racing this year: Anton Krupicka and Timothy Olson. Last year AK was running with the leaders but dropped due to injury. Timothy came in 4th place and wrote one of the most captivating race reports I’ve ever read. I can’t wait to follow along with all the live action this weekend on iRunFar! You can check out Anton’s pre-race video interview here and Tim’s pre-race video interview here. Speaking of Timothy Olson, if you have a minute today you should read this piece he wrote in 2012 called, My Path to Contentment: From Addict to Awakened Ultrarunner. In the article Tim talks about his struggle with alcohol + drugs and how they eventually landed him in jail. More importantly, he talks about running and how it helped him sober up and find happiness. It’s a really nice read. I am obsessed with zoodles! I’m cooking them in the microwave a bit longer than I used to (about 3 minutes now) and they taste so good extra soft! 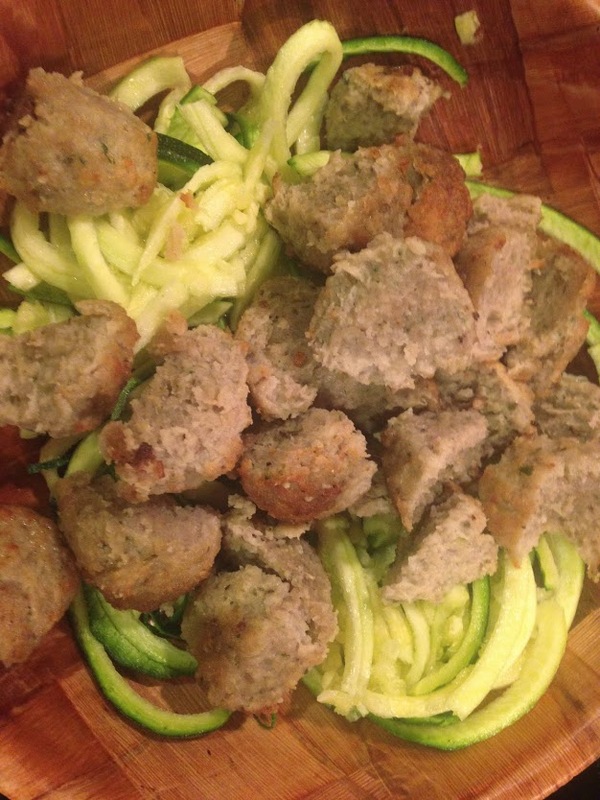 The turkey meatballs are a great addition in my opinion. If you’re vegetarian I’d definitely add some soy meatballs! I ate the zoodles twice already this week and this picture makes me want to make them again tonight! He sits on the lower shelf near my desk a lot, but rarely goes up on the higher shelf which surprises me since he can’t really see out the window on the lower shelf! He’s literally just looking at the wall here lol. For my fellow ultra lovers, will you be following UTMB this weekend? Who are you rooting for? How long is your long run this weekend?? Ooh I hope your quad feels great as the day goes on! When you are tired at 3pm, remember, you don’t need to run later so it’s okay if you’re a little tired! :o) Cecil is hilarious. 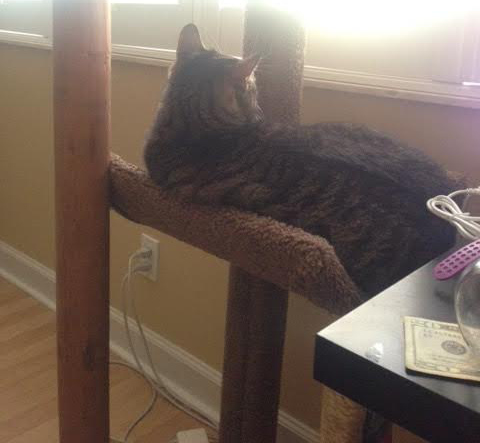 Our cat Basic used to sit in awkward positions like that- starting at the wall and such. I am going to print out that Timothy Olson article and send it to my brother. He is a struggling addict but he is such an AMAZING runner. When he is sober, he has gotten 3 place in ultras and has run like a 3 hr marathon. He’s soooooo athletic and determined. Your brother sounds like such an incredible runner. I hope he enjoys the Tim Olson article. 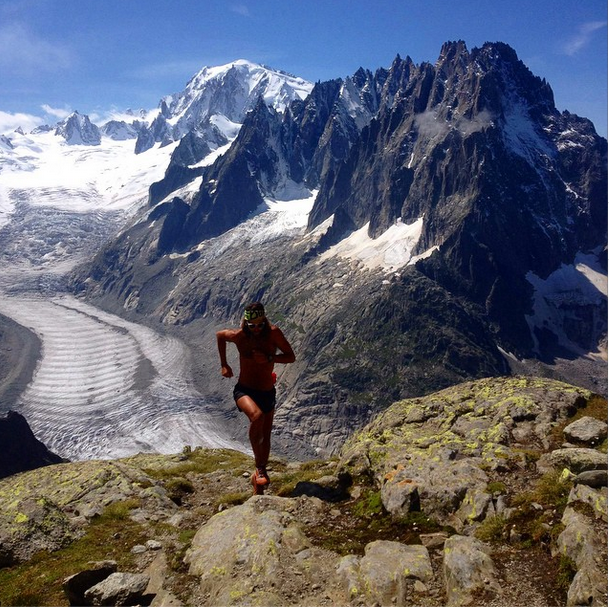 My step brother, Stephen Petretto, is racing in the Ultra-Trail Du Mont-Blanc!! I will definitely be following him. My step sister has been posting photos and it looks beautiful there! WOW so impressive! I hope he is having a great race! I made zoodles for the first time last night! They were so good! Nice!! Before I made them I was a total skeptic on zoodles tasting like regular pasta, but they really do!!! I can’t follow it because I will be in the mountains on a great backpacking trip. (I know, I know, I do this every weekend). But cheers to all running and I expect a full report when I return. I would probably also spent a lot of time watching the US open as well. Hope you two have a great long weekend in the mountains! I’m totally jealous! I am excited to follow the race! I am so glad your quad is feeling better! I’m excited for Rory, she is doing so well! Anton too! I’m going to do a 1/2 this weekend and then work up to a 20 over the next couple of weeks before heading into the taper! Glad you could run – hopefully you don’t have any more issues!! No long runs for me this weekend – I did my last one this morning and will be resting my legs some until my race. Very excited for your race, Kim! 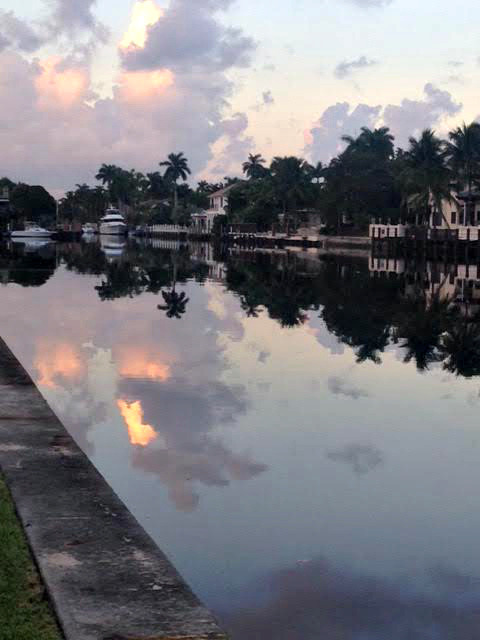 Hooray for a morning run! I feel like we’ve switched places, because I ran both my weekday runs in the evening this week. I guess I wanted to take advantage of an extra hour’s sleep before my super early long run Saturday! That picture of Cecil is adorable. He looks sooo comfy! Haha, well I will be back to my regularly scheduled night runs next week 🙂 Getting up early is for the birds! I did kind of like getting home after work and having dinner at a normal time though! Looked like a beautiful morning run. Hope you survived the afternoon! YUM to the zoodles! Hmm, wonder if I can get a noodle-zoodle maker/tool here in China? You have some of the best running photos!! I ordered the zoodle thingy ma bob, can’t wait to try it. Its at my parents house (bc in DC someone would have stolen my delivery lol). Hope to get it this week!